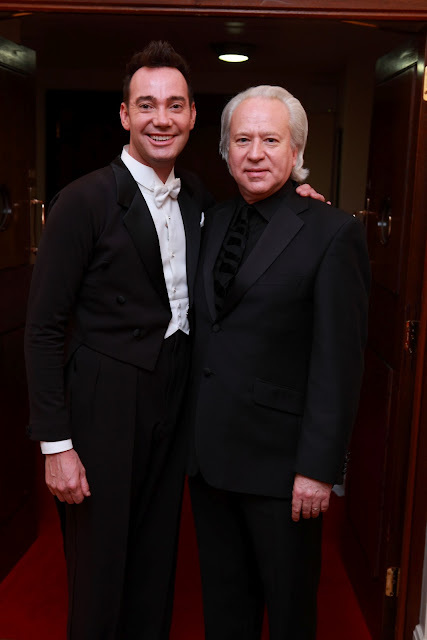 Michael Rosewell, ETO’s Music Director, who is also conducting ETO’s currently touring production of Eugene Onegin, mentored choreographer and Strictly Come Dancing judge Craig Revel Horwood to victory in the BBC Two programme Maestro at the Opera, broadcast last Friday 18 May. Craig beat Oxford Professor of Mathematics and broadcaster Marcus du Sautoy in the finale of the programme. The pair went head-to-head to conduct an excerpt from Puccini’s La bohème with The Royal Opera House Orchestra. Professional musicians in the orchestra cast their vote after the performance to decide who should take the title of Maestro and conduct a full act of the opera in front of an audience. The votes were cast 65 to 35 in Craig’s favour, and after a week of intensive rehearsals, he stepped up to the podium to conduct Act II of La bohème, widely considered one of the most difficult acts to conduct in one of the most complex operas ever written. Despite nerves and in front of a two thousand strong audience at The Royal Opera House, on Saturday 5 May, Craig took to the orchestra pit to lead the cast in the 17-minute act that includes over 200 people on stage, over 1000 props and a real dog. Navigating his way through the complicated music and taking control of almost 250 performers at one point, Craig maintained tempo and wowed his mentor and judges, by remaining calm under pressure and surpassing their expectations. Michael Rosewell will conduct ETO’s final touring performances this season of Tchaikovsky’s Eugene Onegin at Cambridge Arts Theatre on Wednesday 23 May and Saturday 26 May. He will also conduct Britten’s Albert Herring for ETO this Autumn at the Linbury Studio Theatre in Covent Garden and across the country. Watch the finale of Maestro at the Opera on BBC iPlayer now (available until 9:59PM Fri, 25 May 2012). Read an earlier article on Paul McGrath and Michael Rosewell’s involvement in Maestro at the Opera here.